A murder mystery is typically not my favorite read; however, Mostert has created an engaging and spellbinding story with strong characters. You will either love the main character, Gabriel, or hate him for his arrogance as Mostert takes you into the world of an information thief who cleverly accesses information and sells it to the highest bidder. While the reader is getting to know Gabriel and his arrogant and his skewed ethics, Mostert introduces an old lover and a couple of mysteries – one about Gabriel's past and one concerning a missing step son. With these new characters Mostert delves into the complex topic of remote viewing as the reader discovers Gabriel has a hidden talent to sneak into people's minds as well as their information. For the old love, Gabriel takes on the task of finding missing step son. In the process, he meets two women who are amazingly beautiful, smart and talented. However, the slight downfall to this is that one or both of these women could be a killer. Gabriel takes a “ride” through the step son's last moments and discovers he was drowned by a masked woman who is unidentifiable in psi reality. In an attempt to discover the killer, Gabriel hacks into a diary of the women. He gets to know them and plays them or so he thinks. His arrogance and self-assured nature leads him deep into a complex set of events which appears to culminate in these two women chucking him out of their lives. However, the story doesn't end there. Death lurks as Gabriel realizes he has been played by the killer and lost access to determining who the actual killer is. Lives are lost – though I won't say who – love and sanity for Gabriel are all at risk. Mostert has created characters and plot which keeps the reader turning the pages. Glimpses of one mystery are revealed as her main character wanders through a sensual mysterious world created by two witches. The reader may think they know who the killer is but Mostert muddies the water enough to keep the reader engaged and guessing through to the end. 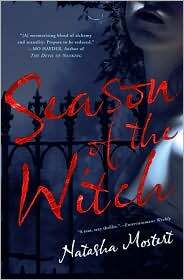 Although the title is Season of the Witch Mostert seems to have minimal knowledge of the occult. There is really only one scene where witchcraft comes into play and that takes place in a store which smells a lot like marijuana. The main character's disbelieving and slightly contemptuous attitude towards witchcraft is perhaps an indicator of the author's own attitude. She mixes psychic ability with alchemy and calls it high magic. If the reader looks at this book as a murder mystery with a dash of sensual pleasure and a sprinkle of science fiction they won't be too disappointed not to have a real witch book. The story is engaging and entertaining enough to keep the reader turning pages to see if the woman Gabriel is falling in love with is a murderer or not.